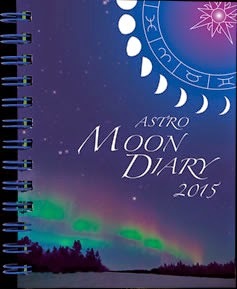 Yesterday I blogged about the Astro Moon Diary 2015 and Seasons Calendar. If you fancy a chance at winning a 2015 Moon Diary then you might like to enter a competition being run by publisher Astrocal. The competition is on Astrocal's website. To enter you need to submit a photo, picture, poem or musings on the Winter Solstice. Astrocal wants to know what inspires you during the darkest days of the year and how you celebrate the turning of the wheel and the return of the Sun. The closing date for competition: 18th December 2014.